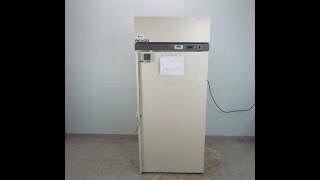 The Thermo Revco Laboratory Refrigerator REL3004 provides a secure, digitally controlled chilled environment for temperature sensitive consumables and media. This upright lab refrigerator comes with built-in microprocessor controls allowing user to toggle between temperature set points, with a range of between 1-8°C and a graphic display that shows you the overall health of the system. The REL3004 Refrigerator features sturdy construction inside and out, with adjustable powder coated shelves, and an automatic sensor that initiates a defrost cycle, minimizing build up and keeping the coils running efficiently and a smooth easy to clean interior. This lab refrigerator also includes an alarm system, with audible and visual warnings in the event of temperature deviations at 5.5°C above or 1.5°C below temperature set point, or in the case of a power failure. 34 x 37 x 78"
26 x 29 x 53"
This Thermo Revco 4°C Lab Refrigerator has been fully inspected and comes with a current temperature validation. All of our lab equipment comes backed with our standard warranty. Should you have any questions, please don't hesitate to contact us.